Panama: “Hard Rock to Rain Forest” A Birders Paradise. 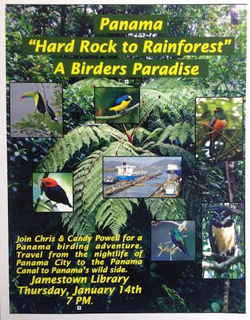 Join is for Chris and Candy Powell’s exciting presentation: Panama “Hard Rock to Rain Forest” A Birders Paradise. Visit Panama City, the Panama Canal and bird the many birding hotspots near the Canopy Tower and Canopy Lodge. From the famous Pipeline Road to mountains of Altos del Maria, Chris, a wildlife photographer, will share photographs of many of the 207 species they added to their bird lists while birding in Panama in 2015. Meet at 8:00am at the entrance to Veterans Memorial Park adjacent to the Bayside FamilyYMCA of Barrington (70 West St). Park in the YMCA parking lot as far from the Y entrance as possible. We will carpool from there since some areas we plan to visit have very limited parking. We will explore several birding spots in Barrington including Echo Lake, Brickyard pond, and the Narragansett Bay shoreline to look for wintering ducks, as well as investigating adjacent shrubby and woods areas for wintering passerines. We are open to suggestions for other birding spots in the area from birders familiar with Barrington/Warren/Bristol. Contact: Jana Hesser, janaehesser@gmail.com or 401-662-7520 with questions or information.